00:47 | Prime Minister General Prayut Chan-o-cha said yesterday that has not yet decided about his political future. He said that he had been told that deputy prime minister Somkid Jatusripitak plans to form a new political party, but as yet he has not been invited to join it or any other political party. Meanwhile, Meechai Ruchupan, chairman of the Constitution Drafting Commission (CDC), said political parties had the right to support General Chan-o-cha as an outsider Prime Minister at the next election if they so desired. 02:08 | Government spokesperson, Lieutenant General Sunsern Kaewkumnerd, has provided details of the draft 2019 budget ahead of it being presented for public consultation. Lieutenant General Kaewkumnerd said that the Bt3 trillion (about US$96 bln) expenditure is based on Thailand’s GDP of Bt17 trillion ($545 bln). Out of the total budget Bt2.26 trillion ($72 bln) will be allocated to the regular budget, Bt660 billion ($21 bln) for investment, with Bt78 billion ($2.5 bln) to be allocated for loan repayments. The Ministry of Education (MoE) is to receive Bt480 billion ($15 bln), the largest allocation, followed by the Ministry of Interior (MoI) at Bt370 billion ($11 bln) and Bt240 billion ($7.6 bln) for the Ministry of Finance (MoF). The 2019 budget is to be submitted to the Cabinet on May 8, and to the National Legislative Assembly (NLA) on June 7. 03:40 | Deputy police chief, Police General Srivara Ransibrahmanakul, has submitted the remaining five cases relating to alleged encroachment and wildlife poaching in the Thungyai Naresuan Wildlife Sanctuary in Kanchanaburi Province by Premchai Karnasutra, CEO of Italian-Thai Development Public Company Limited (ITD), to the Office of the Attorney General (OAG). 05:12 | The Organisation for Economic Co-operation and Development (OECD) has collaborated with Thailand to release the first phase of a Multi-dimensional Country Review (MDCR). The report identifies constraints on development and puts forward policy recommendations. Deputy secretary general of the OECD, Masamichi Kono, suggested that Thailand should implement economic reforms to create high-quality jobs, improve social security, and enhance environmental conservation, as well as improve disaster risk management. 07:39 | Newsline takes a look at the latest edition of the World Bank’s Thailand Economic Monitor, which forecasts the Thai economy to grow by 4.1 per cent in 2018, the fastest pace since 2012. The World Bank suggests Thailand encourage a more innovation eco-system by boosting five areas: competition policy, service liberalization, national data strategy, intellectual property rights, and skilled labour. 12:09 | The Office of the Ombudsman Thailand (OoT) yesterday held a religious ceremony to mark the 18th anniversary of its establishment. 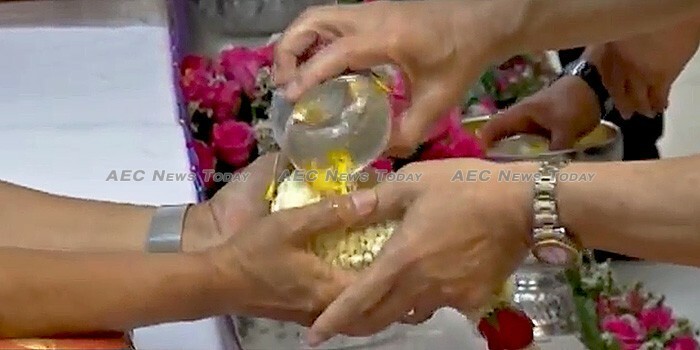 14:20 | Prime Minister General Prayut Chan-o-cha has attended a Songkran blessing ceremony where he poured water over the hands of government officials in accordance with Songkran traditions. Other government agencies have held similar ceremonies. 16:34 | The government is to implement six measures to ensure road safety during the Songkran holidays as part of a ‘Compassionate Driving, Traffic Discipline’ campaign. Measures include reducing risk factors and loss of life in road accidents, maintaining road quality, setting up rest stops and opening special lanes, strict control over vehicles, safety for tourists, marine safety, and readiness of medical personnel and equipment. Meanwhile, the Office of the Insurance Commission (OIC) has introduced a Bt10 (about US$0.31) insurance scheme, which will provide one month of cover free of charge to customers of its partner businesses. 18:28 | Transport terminals across the country have begun to see increased numbers of travellers as people begin heading home ahead of the Songkran holiday. The Transport Co., Ltd., has added 2,690 bus trips to its usual 6,163 daily trips, capable of transporting up to 201,000 travellers. Meanwhile, State Railway of Thailand (SRT) has added 20 trains travelling north and northeast, able to handle up to 120,000 passengers a day. At Don Mueang International Airport (DMIA), flights have been increased from 850 per day to 880 to accommodate the increased number of travellers, with up to 125,000 people a day expected to pass through the airport, a 5,000 traveller per day increase over last year. International travellers are urged to arrive at the airport no less than three hours prior to their scheduled departure time, while domestic travellers should be at the airport two hours ahead. 20:54 | The number of Indonesians who have died after drinking home-made alcohol in Bandung last week has increased to more than 50, with many others hospitalised. Indonesia police have detained at least 12 men in the capital, in addition to the manufacturer of the bootleg alcohol. In 2016 36 people died after drinking after drinking home-made alcohol.